One merely needs to look at the List of defunct department stores of the United States to see the trend of consolidation and retrenchment. 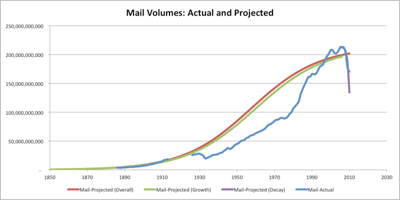 Department stores are just following the trend of truck traffic, mail (the figure on the right by Jessica Schoner illustrates) fuel use, oil cars, travel, drive-throughs, skyways, and any number of other technologies whose functions have been adopted by different technologies, or whose demand has withered. A close examination of a supposedly extinct bygone technology almost always shows that somewhere on the planet someone is still producing it. A technique or artifact may be rare in the modern urban world but quite common in the developing rural world. For instance, Burma is full of oxcart technology; basketry is ubiquitous in most of Africa; hand spinning is still thriving in Bolivia. A supposedly dead technology may be enthusiastically embraced by a heritage-based minority in modern society, if only for ritual satisfaction. Consider the traditional ways of the Amish, or modern tribal communities or fanatical vinyl record collectors. Often old technology is obsolete, that is, it is not very ubiquitous or is second rate, but it still may be in small-time use. Creative destruction has two bits, we all love the creation of new things, but the destruction (or diminution) of the old is a necessary element. We cannot both do all the same things we do now and some new ones. We must do less of the old. Time, space, and money constraints demand it. Sometimes this is widely agreed to be good (telephones replace telegraph messengers), but sometimes it is sadder (yet another locally owned neighborhood cafe in a mixed use four story apartment building replaces my beloved single-story drive-through franchise).